The New Zealand Hockey team needed a tie-breaker to see off England and seal the Bronze medal at the XIX Commonwealth Games 2010 Delhi, here at the Major Dhyan Chand National Stadium today. Luck does not seem to be favouring the England Hockey team once they are forced into a tie-breaker as they lost 3-5 against New Zealand in the third place play-off. England also lost to hosts India via tie-breaker in the Semi-finals. Down 1-3 till 55th minute, England came back splendidly to level scores but in the tie-breaker Adam Dixon's stroke was saved by goalie Kyle Pontifex. Shea McAleese netted the decisive penalty to ensure a podium finish for the Black Sticks. 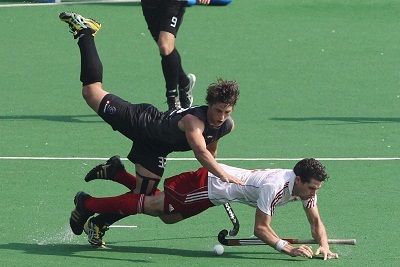 New Zealand went ahead in the eighth minute when Dean Couzins converted a penalty stroke. In the 15th minute the New Zealanders further increased the lead, courtesy a field goal from Nick Haig. The Englishmen pulled one back through Simon Mantell in the 25th minute. At half-time, the score was 2-1 in favour of New Zealand. The men in black increased the lead to 3-1 when Hayden Shaw converted the second penalty stroke. Down 1-3 by the 37th minute, the England team came back strongly. It was Simon Mantell's brother Richard who reduced the margin. Within another five minutes, the English restored parity with Simon making it 3-3. Have something to say? Post your comment. Comments will be moderated and allowed only if they are about this topic and not abusive.